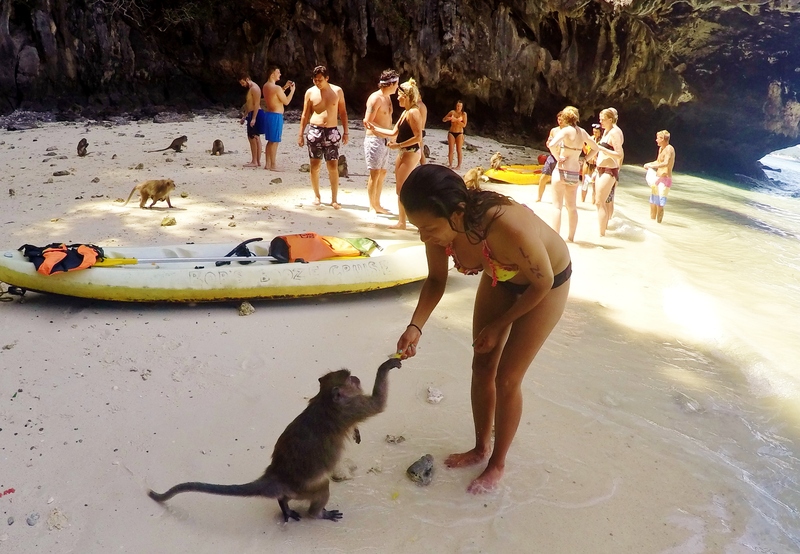 The Phi Phi islands are in the west coast of Thailand. We took a one way ferry from Phuket for 375Baht/pp. Booked it as an open date package from Phuket to Phi Phi to Krabi with a random travel agent on the street. You can probably negotiate each way for 300Baht. The total package to Krabi was 750Baht/pp. We got some wonderful views as the ferry arrived to the island. Of course I had to pose sitting on the edge of the ferry, with my flip flops on, only to drop one of them in the water and remain barefoot for the next couple hours. It’s quite a small island, but somewhere near the north side on the beach or right down the middle. It’s a walking Island, so everything is pretty much walking distance. Stayed at Phi Phi Chang Grand Resort & Spa. It’s neither a resort nor a spa. Just another budget simple hotel. The staff was pretty average with very limited english and location wasn’t the best. Review here. Probably would find something else next time. By Feet – the island is small, there are no bikes or cars so u walk everywhere. The “taxis” here are just for when you arrive and leave the pier. It’s basically a push cart that a guy loads with your luggage and pushes it for you as you walk next to him. Its awesome. SAT, FEB 28: Travel day. Walked around the beach. Booked next day activities. Walked around town. 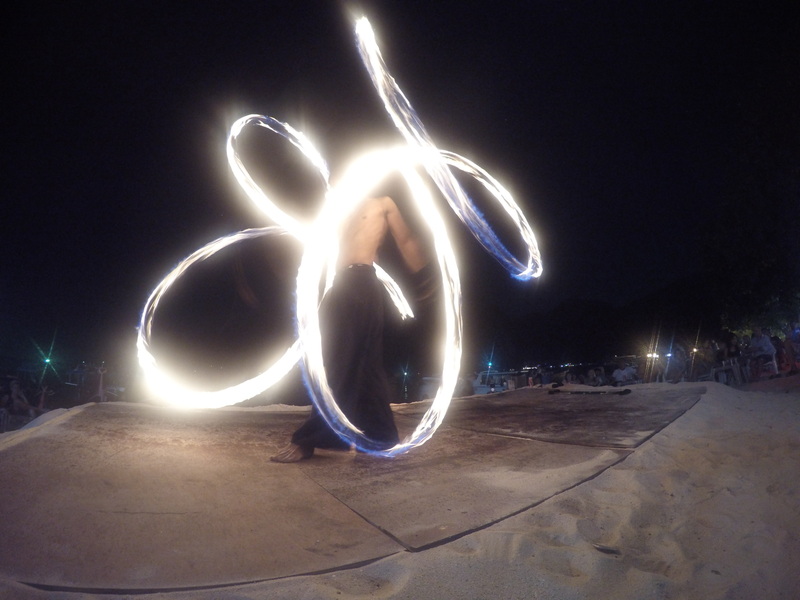 Fire show at Carlitos Bar. Food and drinks. 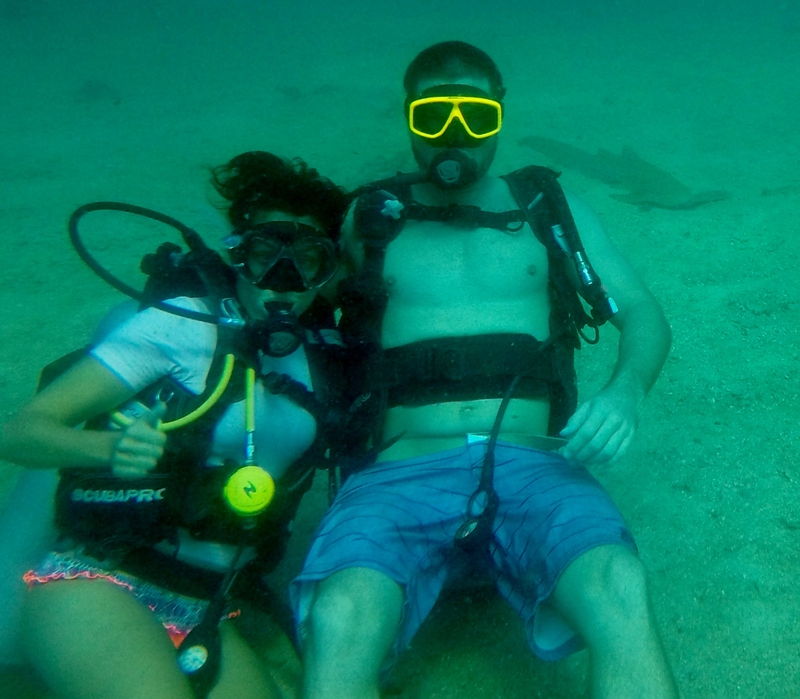 SUN, MAR 1: Diving with aquanouts – Paid 2500Baht/pp/2 dives – Review here. 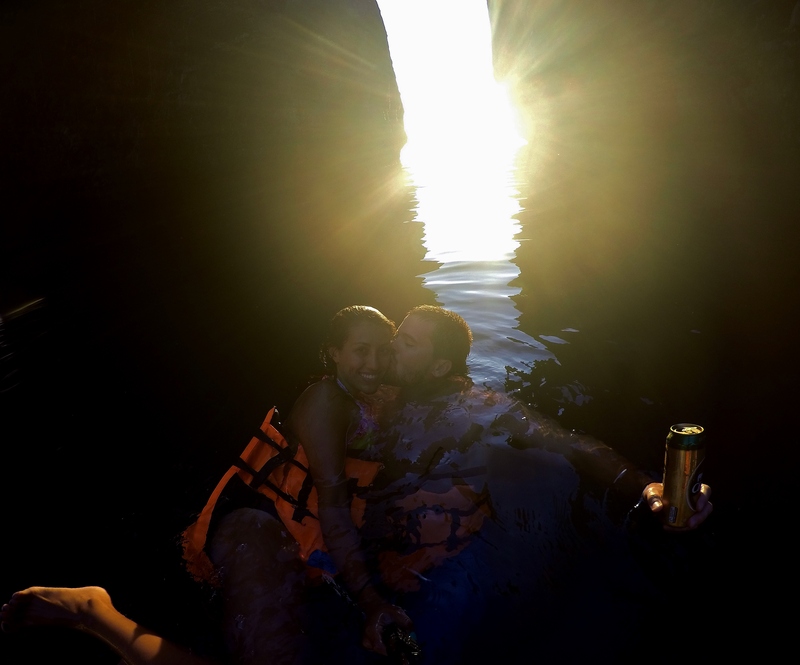 Bob’s Booze Cruise/Maya Beach. Paid 3000Baht for Blaise and 2500Baht for me. (Male/Female pricing) – Review here. MON, MAR 2: Travel day to Koh Phangan. -Stay an extra day or two to watch an outdoor movie at Banana Bar and explore the town and nightlife further. 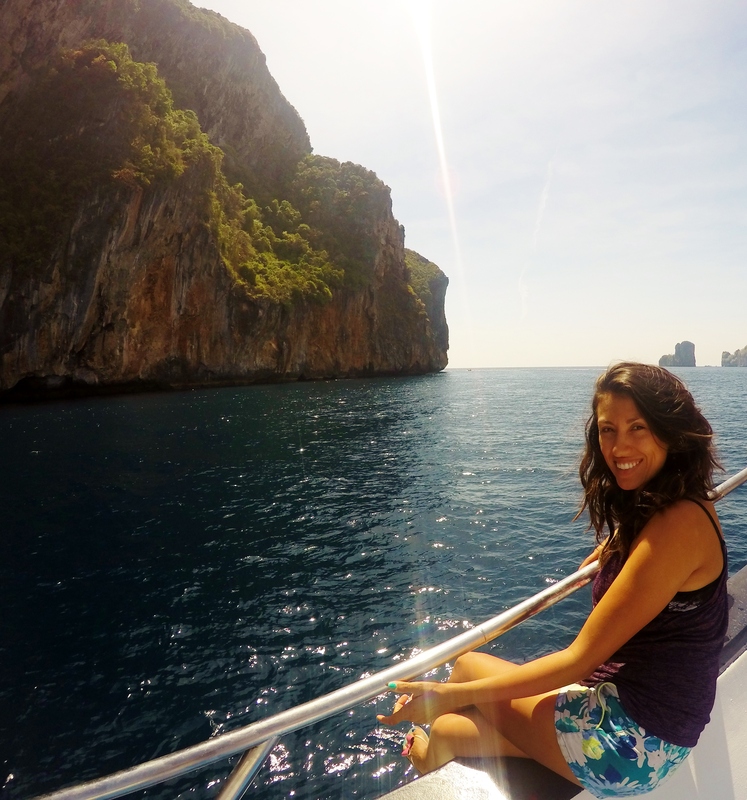 oh, Phi Phi islands.. the two must do are diving and cruising. 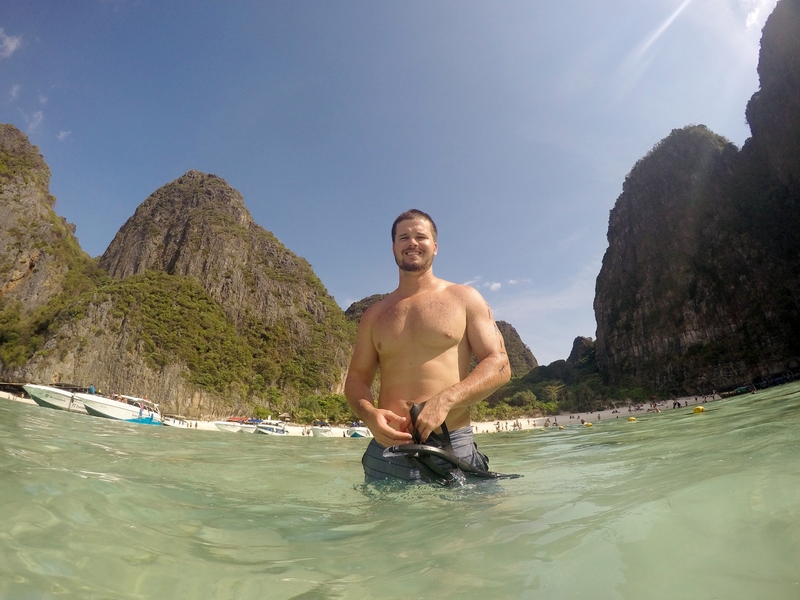 There are so many different dive shops in phi phi and since all of them have agreed on the same price, we went with the two top rated on tripadvisor. 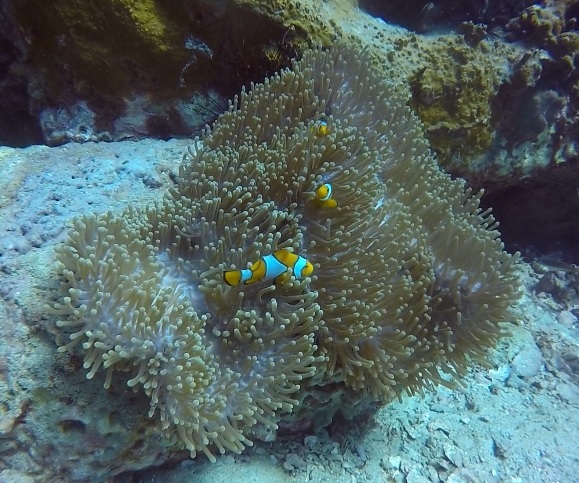 We saw more Nemo’s here than in our Australia dives! The #1 rated shop was Phi Phi diving, when we got there a girl sat us down and gave us the rundown. She seemed rushed, and also a pushy about making us get advanced certification. We knew we didn’t need it for deep dives since we already have our adventure deep dive certification but she quickly disregarded it and kept pushing. We gave the #2 rated shop, Aquanouts, a chance since we didn’t like #1 and it was also recommended by one of Bob’s cruise employees. Mike greeted us with a very friendly and thorough explanation of everything. He quickly became more of a friend than someone trying to sell us anything. We had no doubt this would be a better overall experience, so we decided to book a morning trip that consisted of 2 dives for 2500Baht/pp. Shortly after, we headed towards the port where Bob’s Booze Cruise was located. 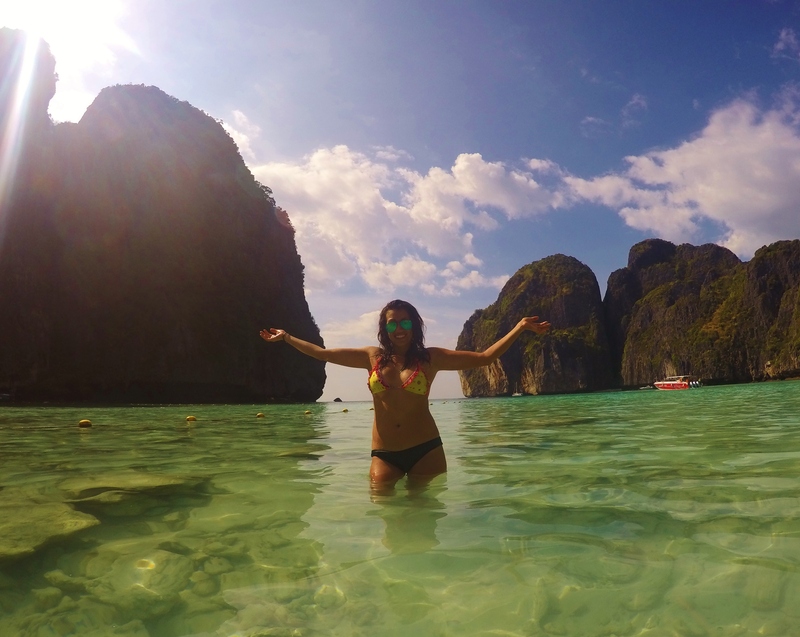 After reading some of the many tripadvisor’s reviews, and the fact that it was the #3 rated activity in the Island, and confirming they go to Maya beach (where Leonardo DiCaprio’s “The Beach” was filmed) we were sold and booked the cruise for 3000Baht for Blaise and 2500Baht for me. Since the cruise includes alcohol, men have to pay more. 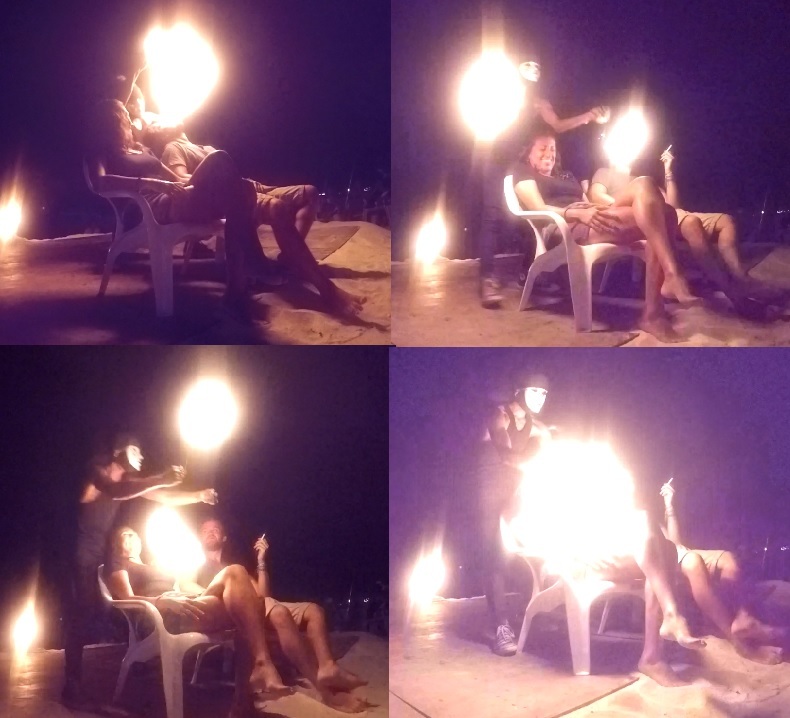 The first night started with a great fire show at Carlitos Bar. Mike, from aquanouts, said it was the best one in the island, and he was right. We got there a bit early to grab beach cushions up front (the bar and show are in the beach). As soon as the show started we actually had to move back a bit as the heat of the fire was quite intense. The whole performance was a bit scary as the tricks they do are risky, but very smooth and fun. At one point I literally had fire balls inches from my face, but luckily they didn’t set my face on fire. During this trick they had the guy next to me light up a cigarette with the spinning ball of fire and since I don’t smoke they just pretended to set my face on fire a few times. There is no actual fee for the show but you have to order drinks and at the end the performers pass around a well earned tips bucket. An early awakening marked the beginning of our second day. We were at the dive shop by 7am where we enjoyed tea and coffee and met our sweet french dive master girl. 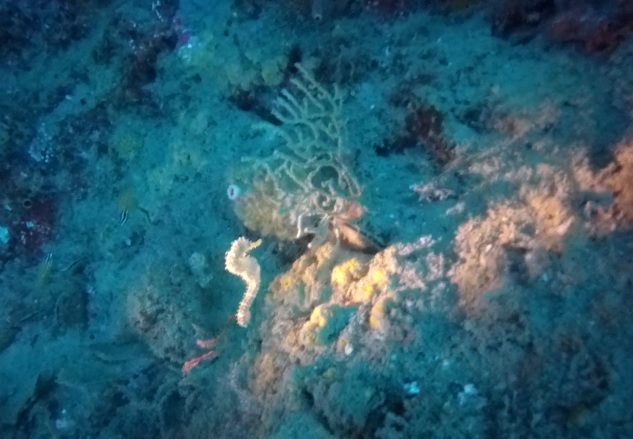 She asked us what we wanted to see and assured us she would make an effort to spot it for us, sure enough midway through our dive she finally found a little seahorse (after searching all over) and later a Leopard Shark, both of the animals I wanted to spot. 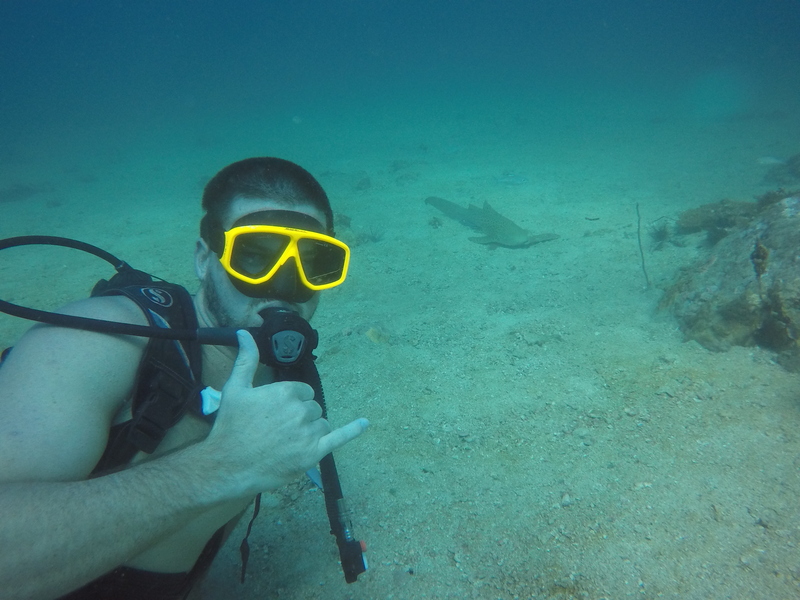 Both of the dives were very satisfying and fun, here we met our new friend Curt who we’ve stayed in touch since. After the dive we went directly to Bob’s Booze Cruise. The cruise was on a sailing boat filled with a group of 15-20 fun young people we quickly connected with. Bob, the captain himself was a bit arrogant, but his crew was amazing. Specially Steve, who told us all about the Viking Cave and rescued our gopro from the depths of the ocean. We stopped outside the Viking Cave, where the famous swiftlet birds make their nests. They are famous because Chinese pay an average of US$2500 per bird’s nest kilogram. They consume it as a soup and believe it has many health benefits and increases virility. Due to mafia around this US$5 Billion industry, tourists are not allowed to enter the cave anymore. It is now protected by the Thai army who, we were told, after 2 warning shots would shoot you if you try to enter it. 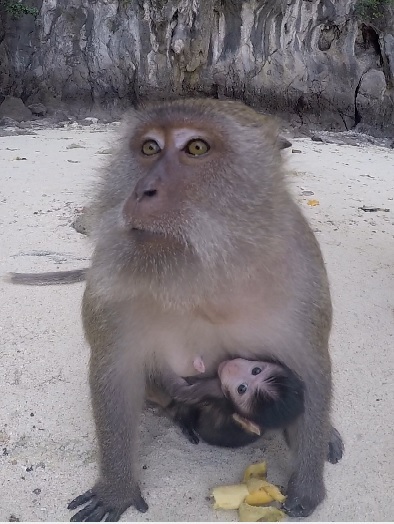 We checked out Monkey Island. Like its name suggests, it is full of monkeys hanging around. It is small and pretty secluded. The crew gave us some food and we fed them. Later in the afternoon the sailboat anchored at Maya Bay in Koh Phi Phi Leh where we jumped a big cliff before checking out the Beach. Cliff jumping is how I lost our GoPro. Blaise had already jumped with it and everything went fine so I decided to do it as well. Little did I know my hand would just lose grip of the selfie stick I though I was holding so tight and the empty water bottles we tied to the stick to make it float would just break off with the bottom cap of the stick and while the bottles successfully floated the stick together with our brand new GoPro and invaluable footage immediately sank to the bottom of the ocean. Blaise and Steve immediately came to the rescue and went into the water to look for it. 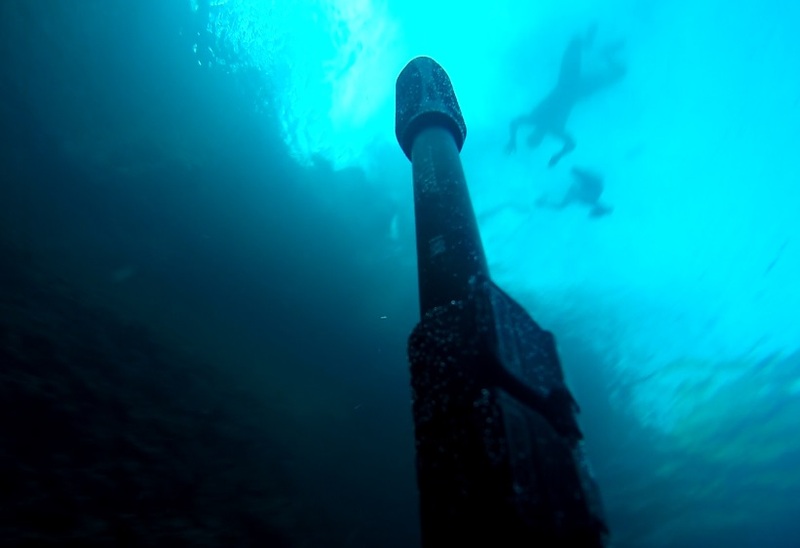 Fortunately Steve had a snorkel and fins and was able to free dive to the bottom and find the GoPro that was still recording the experience. We had to go into a cool little cave and then through the jungle to be able to access the famous beach where Leonardo DiCaprio’s “The Beach” movie was filmed. It was later in the day so thankfully not crowded with too many tourists. Later on we moved to a secluded beach surrounded by limestone cliffs to enjoy the sunset. We were wearing life jackets as diapers for ease of floating and drinking. 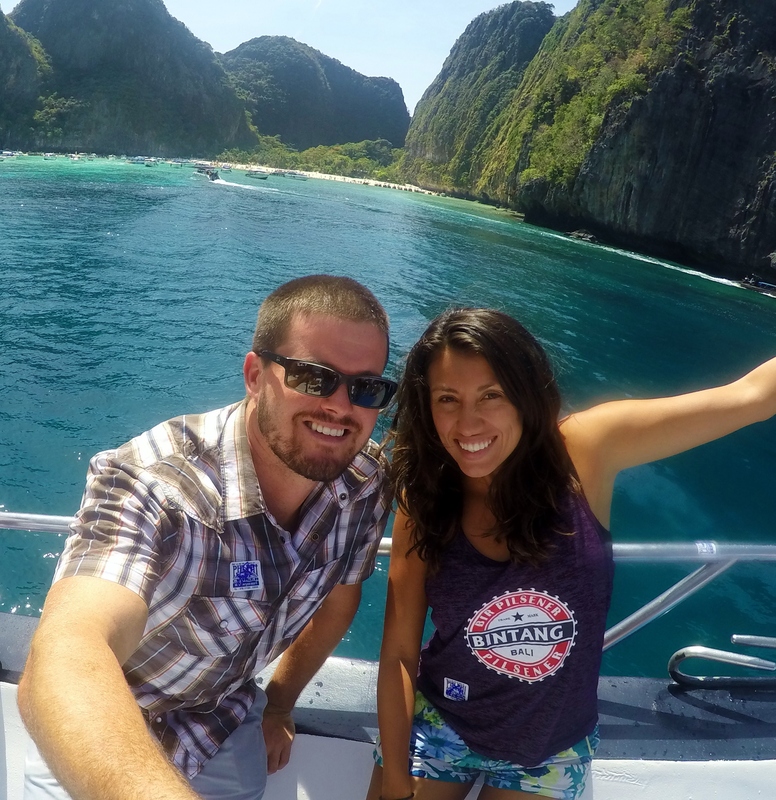 Phi Phi was amazing and we wished we had spend an extra day or three there! Cool! What a great Phi Phi experience! Mine was exciting, but not that exciting! That was brave to let some dude swing fire inches from your face. I wanted to go cliff diving there, but had no luck. Awesome! I bet there’s some cool footage with the GoPro sinking. 4 months ago…the time of my life…ahhhh…I need to go back!